THE MAIN ENTRANCE TO THE TUNNEL at Liverpool is situated in the Old Haymarket. The subsidiary entrance is conveniently placed to serve the dock system. The length of the main tunnel is 3,751 yards, and the branch tunnels on either side of the river bring the total length of roadway to 5,064 yards. Work was started on the Mersey Tunnel on December 16, 1925, and it was officially named Queensway and opened by King George V on July 18, 1934. ENGINEERING skill can harness the power of Niagara, or control the level of the River Nile, but it is human enterprise which causes these things to be done. The phrase “human enterprise” has been used so often in political speeches that much of its significance has been lost. When it is applied to such a subject as the Mersey Tunnel, however, the real significance of the term becomes more clear. The Mersey Tunnel is an achievement that represents the concerted energies of thousands of men over a period of years. It is an imperishable record of the labour of workmen who toiled in the bowels of the earth, underneath a fierce tidal river bearing a large part of the world’s shipping. Such a colossal engineering undertaking represents more. It represents the realization of the dreams and ambitions of men of foresight, men who plan for the future and see that those plans are put into action, however difficult the achievement. Such men as these conceived the idea of an underwater tunnel to link Liverpool with Birkenhead. The engineers devised the means and skilled workmen carried out the work. Thus human enterprise once more achieved a conquest over a problem aggravated by the forces of Nature. The Port of Liverpool owes its existence to the River Mersey, a broad tidal stream wide enough and deep enough to act as a highway for world shipping. At the same time, this mighty river proved to be a great barrier. It separated the two halves of the port. Dock systems lie on either side of the river, but because at its narrowest point the Mersey is nearly a mile wide, it effectively divided one economic unit into two parts. The problem of communications between Liverpool and the towns on the Cheshire bank has for a hundred years or more been of paramount importance. To establish ferries was the first movement to overcome the difficulty, and thus, of necessity, came the ferries that are among the most efficient in the world. But ferries, however efficient, can never be a strong enough vital link in the communications of a large industrial area. With the spectacular increase of road traffic the problem became acute. The vehicular ferries could scarcely be expected to deal with the motor traffic of a port of world importance. The question was whether to bridge the Mersey or to build a tunnel beneath it. In 1922 the problem was tackled at the instigation of the late Sir Archibald Salvidge, one of the most prominent leaders Merseyside has known. His proposal that a committee be appointed to examine the feasibility of a scheme of Merseyside federation and the improvement of transport facilities was unanimously accepted by the City Council. Merseyside is composed of four major units - Liverpool and Bootle on the Lancashire bank, Birkenhead and Wallasey on the Cheshire bank. These municipalities sent, delegates to a Merseyside Co-ordination Committee, which commissioned some engineers to report on the relative merits of a bridge and a tunnel as a link across the river. The engineers were the late Sir Maurice Fitzmaurice, Mr. (now Sir) Basil Mott and the late John A. Brodie. The possibility of a bridge was fully considered. It was decided that such a bridge would need to have a span of 2,200 feet, a headway of 185 feet and a width of 90 feet. The cost of a bridge between Liverpool and Birkenhead was estimated at £10,550,000. The estimate for a roadway tunnelled beneath the river, however, came out at £6,400,000. In addition to its economic advantages, the tunnel would have branches on either side of the river. Thus the report pointed to the advisability of a tunnel larger than any subaqueous tunnel ever before conceived. Towards the realization of that scheme Sir Archibald Salvidge resolutely worked. For two years the matter was discussed. The immense cost of the undertaking was not the only difficulty. It became apparent that the four Corporations could not agree, and in the end Wallasey and Bootle dropped out, leaving the entire responsibility to Birkenhead and Liverpool. Finally, in 1925, Parliament sanctioned the building of the Mersey Tunnel. Princess Mary, the Princess Royal, released the power which operated the first drills on December 16. 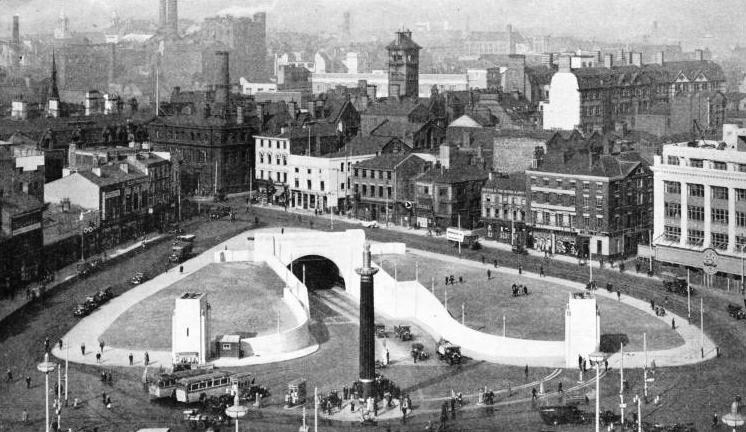 On July 18, 1934, the Mersey Tunnel was opened to traffic by His Majesty King George V. The main tunnel has a length of 3,751 yards, from the Old Haymarket, Liverpool, to King’s Square, Birkenhead. The branch tunnels which lead to the docks on either side of the river bring the total length of roadway to 5,064 yards, or nearly three miles. The width of the roadway in the main tunnel is 36 feet between the kerbs, which allows for four lanes of traffic. In the branch tunnels the roadway is 19 feet wide. Thus the capacity of the Mersey Tunnel is 4,150 vehicles an hour, spaced at intervals of 100 feet apart and moving at a speed of 20 miles an hour. At this speed vehicles run through the tunnel in six and a half minutes. For a length of more than two miles the tunnel has an internal diameter of 44 feet and the bottom of the tunnel at its lowest point is 170 feet below the level of the Mersey at high water. This enormous tunnel, burrowed beneath the mighty river, is a monumental feat of engineering skill. The excavation alone was a stupendous achievement, as 1,200,000 tons of earth and rock were removed. The rate of excavation was more than half a ton of rock for every minute between June 1926 and August 1931. The haulage of the rock to Storeton Quarry, on the Cheshire side, and to Dingle and Otterspool on the Lancashire side, was all done at night. Heavy motor haulage is a specialized industry on Merseyside, and there were fine fleets of powerful wagons available for this work. In place of Storeton Quarry, a disused quarry about 80 feet deep, there is now a field 9 acres in extent. On the opposite side of the river the excavated rock was used for the reclamation of land and for the building of a river wall and embankment. At first the excavation was done by pneumatic hammers, but the rate of excavation was increased by the use of explosives. In all, 147,000 lb of gelignite were used for this purpose. The great danger that was expected was the seepage of water into the workings, particularly in the under-river sections of the tunnel. Shafts were sunk on either side of the river, 21 ft 2½ in. in diameter and 190 feet deep. These shafts were lined with cast iron until the red Triassic sandstone strata was reached; after this no lining was necessary. About halfway down these shafts two pilot headings - exploratory bores - were driven, one at the top and the other at the bottom of the cross-section of the proposed main tunnel. The pilot headings were 15 feet wide and 12 feet high. No lining was required for these headings except in the vicinity of faults in the rock. 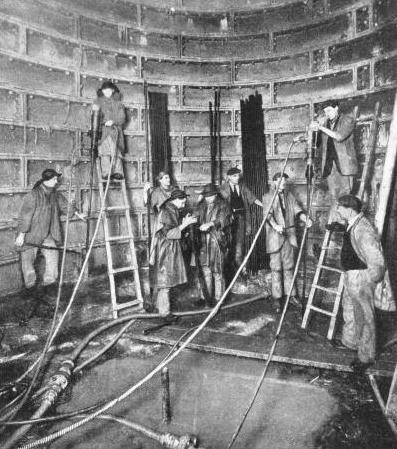 THE CEMENTATION PROCESS in use during the sinking of the vertical shaft at Liverpool. Boreholes, 2-in in diameter, were sunk in advance of the shaft. Through these boreholes a cement mixture was injected under pressure to fill up and seal all faults and fissures in the rock. The vertical shafts had a diameter of 21 ft 2½-in and were sunk to a depth of 190 feet. To obviate the influx of water a special cementation process was used. Cement was injected under pressure through boreholes in the rock. The cement thus filled the local fissures through which water might pass into the working. When 850 feet of heading had been driven from the Liverpool shaft, and 1,170 feet from the Birkenhead shaft, it was found that the flow of water was not sufficient to warrant the continuation of this process. A considerable influx of water, however, had to be dealt with. The Liverpool heading was started first and a special drainage heading, 7 feet in diameter, was driven from the foot of the first shaft up a gradient of 1 in 500 to meet the lowest part of the tunnel under the river. 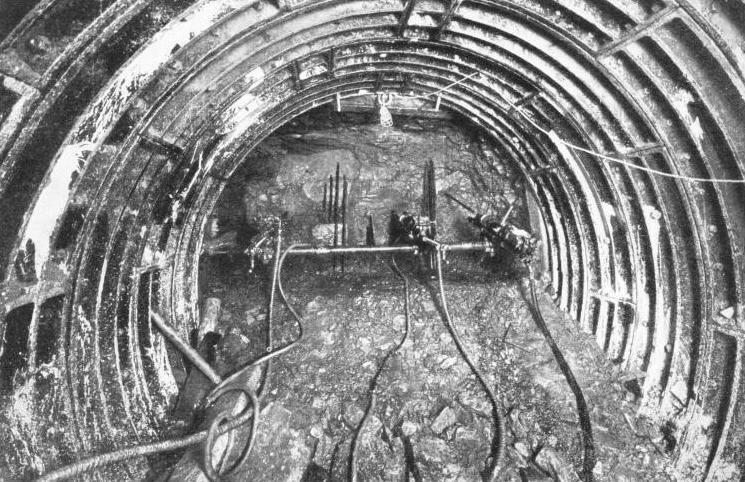 Drainage shafts were driven vertically to connect the pilot headings with the drainage heading. The flow of water in this heading was found to be 2,410 gallons a minute. On the Birkenhead side, however, the influx of water was found to be considerably less and this could be adequately dealt with by the use of pumps. When the pilot tunnels met beneath the river, all the water drained by gravitation into the Liverpool drainage heading, from which the maximum quantity of water pumped was 4,300 gallons a minute. The purpose of the pilot tunnels, each the size of a London Tube railway tunnel, was mainly exploratory. The lower tunnel was driven in advance of the upper heading and vertical boreholes were made to discover the nature of the rock through which the upper tunnel would have to be driven. Similarly, boreholes were driven in advance of the heading to give due warning of any difficulty that might have to be encountered. Twenty-seven months after the start of the work the two headings met. This was an occasion of great importance. Sir Archibald Salvidge, whose efforts in favour of the enterprise had such great effect, broke through the thin wall of rock. Clad in sou’-westers, oilskins and gum boots, a party of distinguished members of the Liverpool and Birkenhead Councils exchanged greetings 150 feet below the River Mersey. Meanwhile, a full-scale experimental tunnel, 300 feet long, was being built on the Birkenhead side. Because there was no precedent for many of the problems involved in building such a large subaqueous tunnel, the engineers decided that it was necessary to complete a section of the tunnel to find out which method would be most satisfactory. The most suitable method of procedure was found to be that of excavating the upper half of the tunnel first. As the work progressed the cast-iron lining was fitted in segments of 24 inches. Then the lower half was excavated while the upper semicircle of the lining rested on the natural rock. The upper segments were then bolted together before the support of the rock was removed and the lower segments of the lining erected. 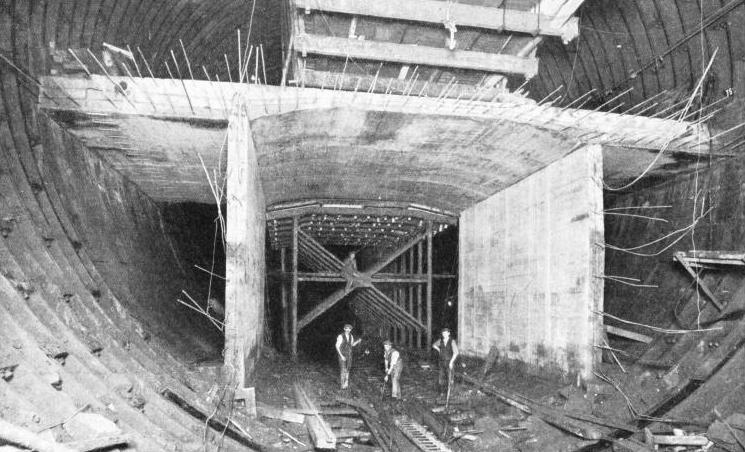 Before the building of this experimental section of the tunnel it had been thought that the segments could not be made longer than 18 inches, but experiment not only proved that it was safe to extend the length of each segment to 2 feet. This reduced the cost of the work but also increased the rate of progress. UNDER THE RIVER the pilot headings were lined with cast-iron segments only near suspected faults in the rock. Two pilot headings, 15 feet wide and 12 feet high, were driven along the line of the main tunnel for exploratory purposes. Exploratory boreholes were driven ahead of the pilot tunnels to give warning of possible difficulties. The method of erecting the lining was of great importance. Although at certain places it was necessary for the segments, which weighed 17 cwt, to be erected by hand, a special machine was designed to assist the process. Operated by compressed air, the machine was mounted on a truck which moved on rails laid in the tunnel. The erector had a telescopic arm which could be rotated and was moved as the segments were put in place. The enlargement of the upper pilot heading to the full diameter was the first operation on the main tunnel. At several points in the upper tunnel rock was excavated into chambers in which the erectors were placed after the first segments of the lining had been fitted by hand. Except when the rock surface was unusually broken or dangerous, enough space was excavated for two segments to be fitted at one operation. In the midstream portion of the tunnel there was a thickness of only 3 ft 6 in of rock between the roof of the tunnel and the bed of the Mersey. Here it was necessary to support the arch with timbers reinforced by steel bars. Pneumatic hammers were used instead of explosives for excavating in this vicinity. The removal of debris required careful organization. An electric railway was already laid in the lower pilot tunnel, and it was decided to make use of this. Chutes were excavated from the upper to the lower tunnel. Down these chutes the debris was shot, and then shovelled into the wagons which were hauled by electric locomotives to either shaft. When the two tunnels were enlarged into one, the railway lines had to be moved, for they impeded the enlargement of the lower semicircle. A temporary roadway was then suspended from the arch, and the lines were re-laid on this hanging roadway. Lifts at intervals handled the debris, and thus the remaining excavated matter was removed. When the main tunnel had been fully excavated and the lining completed, over 1,000,000 segments had been used, exceeding 80,000 tons in weight. The greatest care was taken to see that no water leaked into the lining before the segments were backed with cement. The empty space behind the lining was packed by hand with pieces of rock. In every segment two holes were provided through which thin cement, known as grout, could be injected under pressure. The grout injected was composed of water and neat cement. This was injected at pressures up to 120 lb a square inch, and thus could be forced into neighbouring fissures in the rock as well as filling the interstices in the packing. A further possible source of seepage was through the joints in the lining. These were caulked systematically with lead wire. of which more than 170 miles were used. THE EXHAUST TOWERS of the six ventilating stations, three on either side of the river, range in height up to 210 feet. Each building contains duplicate sets of blower and exhaust fans which range up to 28 feet in diameter. The fans can deliver 2,500,000 cubic feet of fresh air into the tunnel every minute and an equivalent volume of air is withdrawn at the same time. A different method was used for building the branch tunnels and the sections of the main tunnel that ran under the land. The branch tunnels were built to provide direct entry to the Mersey Tunnel from the dock systems on cither side of the river. The Birkenhead branch comes to the surface at Rondel Street, at a strategic point in the Birkenhead Docks. The Liverpool branch leaves the main tunnel about a quarter of a mile from the entrance and curves back to the river front, emerging at New Quay, a short distance north of Pier Head. The branch tunnels have an internal diameter of 26 feet, and the full circle was not excavated. Above the roadway they are semicircular, but the rock beneath has been excavated only to form a shallow invert (inverted arch) with its lowest point 10 feet below the diameter of the semicircle. The invert was built of concrete, waterproofed where necessary. When the tunnel, on its approach to the surface, passed above the water level in the rock, steel rib and concrete lining was used. When the tunnel passed into soft ground nearer the surface, however, the cast-iron lining was reverted to, to give added strength to take the weight of the surface buildings. Except for the Liverpool entrance to the main tunnel, the ends of the tunnel were built by cutting a trench from the surface. The tunnel was built in this trench and the covering was replaced. In Liverpool, however, the end of the tunnel ran beneath Dale Street, one of the busiest streets in the heart of the city. A different method of procedure was suggested - the use of a hydraulic shield. The design of this shield involved complex problems. Shields for tunnelling purposes are generally circular hut in this instance it hail to be semicircular. Again, a shield of such dimensions had never before been built. Furthermore, it had to be workable in rock, clay and “made” ground near the surface. Eventually a suitable shield was built in the tunnel 700 feet from the entrance. The shield, which weighed about 200 tons, had a length of 12 ft 6 in and an overall diameter of 46 ft 9½ in. It ran on steel rollers at either side. The rollers ran on concrete beds, which were laid in small headings driven in advance of the main tunnel. Where the branch tunnels converged on the main tunnel it was necessary to enlarge the excavated area considerably. The junction chambers were excavated to a height of 48 feet for a length of 55 feet and a width of 72 feet. The centre of this space was not cleared until the reinforced concrete side walls, 5 feet thick, had been built up to the point where the arch begins. The arched roof, composed of steel joists and concrete, was built in sections and finally the “dumpling” of rock was cleared away. As lengths of the tunnel lining were finished work was begun on the roadway, which was built 1 ft 6 in below the horizontal diameter. Thus, in the under-river section of the tunnel there is almost as much space beneath the roadway as there is above it. There is room, therefore, for a second roadway to be built at a lower level, should the volume of traffic make this necessary. The roadway is made of reinforced concrete, anchored at either side by the cast-iron lining. The roadway is supported in the circular section by two intermediate walls, 12 inches thick and 21 feet apart. In the shallow invert section of the tunnel the road is supported on columns spaced 7 feet apart. “Gunite” rendering, which forms the strongest concrete composition known and is sprayed on by a specially designed gun, was applied to the surface of the tunnel. A waterproof layer of bitumen emulsion was next applied, and this was covered with a special finish in a pale oatmeal colour. Finally a glass dado was built to a height of 6 ft 3 in throughout, the full length of the tunnel. The dado is composed of sheets of jet-black glass, a quarter of an inch thick. BUILDING THE ROADWAY through the Mersey Tunnel. Made of reinforced concrete, the roadway is supported by two intermediate walls, 12 inches thick and 21 feet apart, and is anchored to the cast-iron lining. The finished road in the main tunnel has a width of 36 feet between the kerbs. The tunnel has a capacity of 4,150 vehicles an hour, with cars 100 feet apart and moving at twenty miles an hour. The space beneath the roadway acts as the duct for fresh air and is sufficiently large to provide a second road or railway should they be necessary. 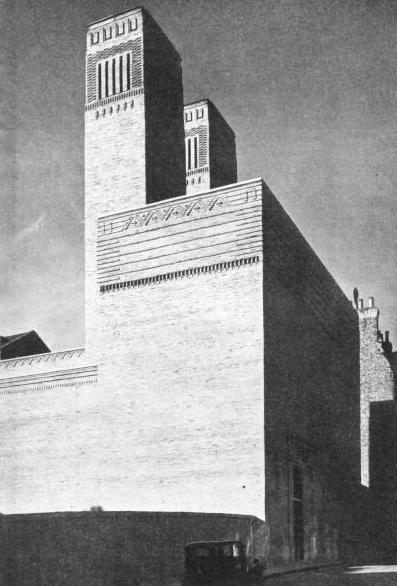 One of the greatest problems encountered in the design and building of the Mersey Tunnel was that of ventilation. The problem was unique in the history of engineering. For the first time in the annals of science a means had to be found of ventilating a tunnel more than two miles long and 150 feet deep, with internal combustion engines passing through at the rate of 4,150 an hour. The problem was so important that extensive full-scale experiments were made before the choice of a ventilation system was made. As soon as a 1,000-feet section of tunnel and roadway had been completed on the Birkenhead side, this was used for the large-scale experiments. Temporary blowing and exhaust fans were installed, with a combined capacity of 600,000 cubic feet of air a minute. Brick bulkheads were built across either end of the experimental section of tunnelling. In this section quantities of damp straw, which produced dense smoke, were set alight. A steam boiler which made heavy clouds of vapour was drawn through the tunnel, and the effect of various ventilating systems was calculated. Finally, it was decided to use the upward semi-transverse system. By this system of ventilation pure air is blown through the ducts beneath the roadway. The air enters the upper half of the tunnel through orifices placed at intervals of 18 inches at roadway level. The orifices are graduated in size to ensure an even distribution of pure air throughout the entire tunnel. The impure air is drawn along the roof of the tunnel itself to the exhaust chambers at each of the six ventilating stations. These stations, three on either side of the river, provided an architectural problem of no mean order. Air had to be taken in through the roofs of the buildings rather than from openings in the walls. Duplicate sets of blower and exhaust fans, ranging up to 28 feet in diameter, are housed in each ventilating station. The buildings are divided into three airtight compartments, one for the blowers, one for the exhaust set and one for the switchgear room. The fans can deliver 2,500,000 cubic feet, of fresh air to the tunnel every minute and withdraw a similar volume. The largest of the fans, 23 feet in diameter, is housed in a casing 50 feet wide. All this machinery is controlled from a central operating room in the George’s Dock, Liverpool, ventilation building. Here are centred all the instruments which record the conditions of the ventilation system at all parts of the tunnel. Precise instruments record the visibility in the tunnel, measure the exact quantity of poisonous fumes and register the flow of air. Invisible rays across the tunnel record the number of vehicles that pass and an automatic counter shows how many vehicles are in the tunnel. SUCH is the Mersey Tunnel, named Queensway, built at a cost of more than £7,000,000. Of this amount £2,500,000 was granted by the Government with the stipulation that Queensway should be free of toll after a period of years. A journey through this great underwater tunnel is a unique experience. At the head of the incline leading to the main Birkenhead entrance in King’s Square, a semicircle of well-designed toll booths is ranged. 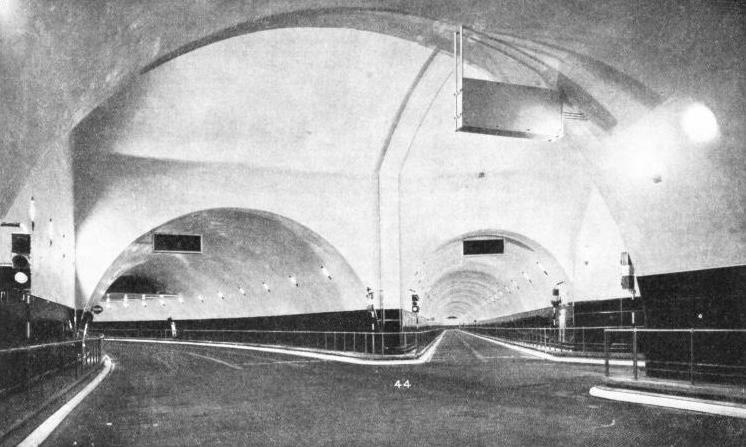 In the tunnel itself raised blocks of rubber divide the roadway into four lanes for traffic, two in either direction. The outside lanes are restricted for the use of traffic with a speed of under twenty miles an hour. In the centre lanes speeds up to thirty-five miles an hour are permitted. As the tunnel roof passes overhead the region of perpetual light is entered. A quarter of a mile down automatic traffic signals control the junction of main and branch tunnels. As the car descends round a curve into the under-river section of the tunnel a faint mist obscures the distance and the great arch appears to stretch into infinity. Then the passengers are suddenly aware of a change. They are ascending instead of descending. They have passed from one county to another and 170 feet above are the turbulent waters of the Mersey. The gradient continues and still the tunnel shows no sign of ending. The floodlit alarm stations still flash by and other vehicles, seeming almost from another world, pass and are gone, dwarfed by the colossal arch of the tunnel. THE JUNCTION CHAMBER on the Birkenhead side of the tunnel. The branch tunnel leads to the dock system, and the roadway is 19 feet wide between kerbs. The chamber was excavated to a height of 48 feet for a length of 55 feet and a width of 72 feet. A black glass dado, 6 ft. 3 in. high, lines the tunnel. Fire-alarm stations and telephone boxes are arranged at intervals of 150 feet and ordinary traffic signals control the traffic at the junctions. Click here to see the colour plate showing the Mersey Tunnel.